Whatever will they eat next? My beady gastronomic eye was caught recently by a couple of column inches in L’Indépendant’s second section which is devoted to news from all the local villages and towns. The peaceful, small coastal border town of Cerbère, known primarily for its frontier “international” railway station separated by a tunnel from Spanish Port Bou, had just held its first Oursinade in which oursins were served. I knew that an “ours” is a bear, so maybe an “oursin” was a baby bear. 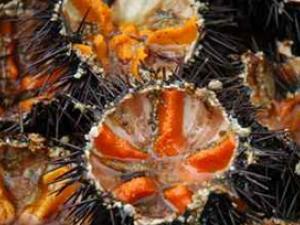 However, you could hardly serve baby bears at table so I looked up the word and found that an oursin is a sea urchin. I was still none the wiser until I had googled a while and found out that this prickly creature of the sea has its devotees who eat it both raw and cooked, but apparently mostly raw. Anyway, the stalwarts of Cerbère known as “Les Amicales des anciens d’Afrique du Nord” – roughly “The Social Club of the Pieds Noirs” (Frenchmen born in North Africa during the colonial days) – had held in late March their first oursinade “in a warm and convivial atmosphere”. The event was suitably oiled, of course, by the ubiquitous “verre d’amitié” (glass of friendship), a euphemism for many litres of local plonk of varying strengths and colours.The day was perfect, with a warm spring sunshine “cradled by the gentle lapping of the waves”. And whilst we’re on the subject of Cerbère, alas, the cheminots or railway workers of Cerbère are much less happy than our oursin-eating friends. Formerly a vast railway depot for the storing and maintenance of long-distance engines and rolling stock, the station complex has experienced a drastic reduction in its functions and departures. No longer can you get an overnight train to Rome, nor even Vintimiglia on the Italian border. The last long-distance train out is the 21h.21 to Paris. Likewise, the stock maintenance is being transferred to Nîmes. The station itself is very run down: the platform train times and destinations are still being mounted manually by young railway staff (sometimes jauntily sporting long pony tails beneath their peaked white caps) rather than being displayed on electronic screens. Even the level crossing just north of the station is still operated by a real signalman in his box! Result: a lot of unhappy and soon-to-be-redundant cheminots who sometimes air their grievances jointly with their fellow workers across the border in Port-Bou. Worst of all, at Cerbère they now have to suffer the humiliation of seeing mile-long privatised goods trains stopping for the gauge change, wheel-tapping etc on their way from Ford Dagenham UK to Spain. I digress! Back to oursins. 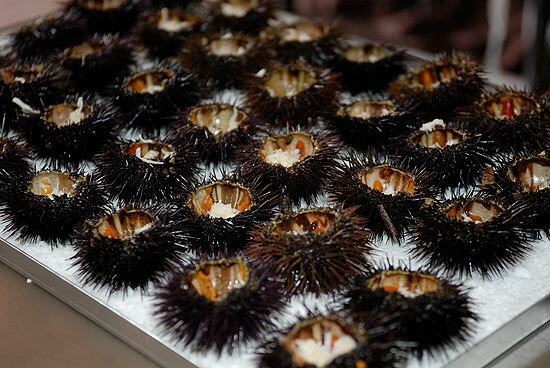 I have discovered that oursins are a very popular winter delicacy just over the border on the Catalan coast of Empordà. According to one source, these creatures are de-spiked, cut in two and then the red, fleshy gonads are scooped out with a spoon and eaten with oil or butter and bread. The gonads – which, if you must know, are undifferentiated germ glands that serve as both ovary and spermary – are also used in omelettes, creamy soups, and in many exotic dishes in starred gourmet restaurants. Finally, you can eat these creatures at two winter festivals in France outside our Département: one is held at the small Provençal coastal town of Carry-le-Rouet, 35 kilometres west of Marseilles, and the other 10 kilometres further west at Sausset les Pins. Bon appétit! But beware of trying to catch your own urchins if you are a snorkeller. Some 750 varieties are poisonous!